Pain scales are designed to measure the intensity of our pain, but since pain is a subjective multidimensional concept, we take much more than intensity into account when we try to tell someone how much we hurt; things like the type of pain, its location, its impact on our life, and so on. In short, pain scales oversimplify the pain experience, particularly if you live with chronic pain. Drawing might help us better express our pain experience. A team headed by Adrianna Loduca at Sao Paulo Catholic University have been successfully using pain portraits plus interviews in their clinical practice. After meeting with Adrianna’s team, I led a service evaluation to explore the feasibility of incorporating the Brazilian protocol into the UK NHS setting. The images here are part of a set collected during the service evaluation. Before the programme (inset picture) this person called her pain ‘Rot’ and said that the pain wiped out everything that was good. 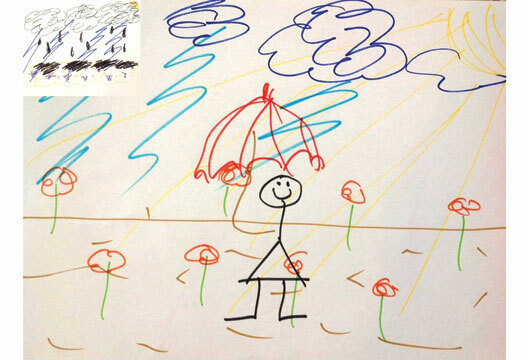 The drawing shows a garden, sodden and struck with lightning with the sun almost completely obliterated. After the programme, the garden and the sun are more visible and most strikingly, she is in the centre of her drawing. Her pain is renamed ‘Arrow’ because she can target it with her newly learned coping skills (symbolised by the umbrella), and in so doing, she can now see a life outside her pain.